Batubulan is in the west part of Gianyar regency of Bali. Batubulan has been famous both in Indonesia and world-wide for the artistic blessing Barong dance (Bali Barong Dance and Bali Keris dance) and Bali stone carving. 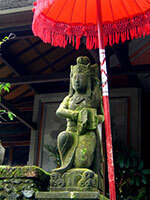 Mas is famous in Bali as being one of the main arts and crafts villages on the island. Where Ubud is the village of the painters, Mas is the village of the carvers where some of the most incredible woodcarvings are produced and have been produced for hundreds of years. Carvings range from very small pieces that can be perfect gives up to larger ornaments and furniture and on to incredible elaborate pieces that can be as large as 25 square meters and even more such as murals ad great door arches that are traditionally reserved for temples and stately homes of the Balinese Royalty and wealthy. 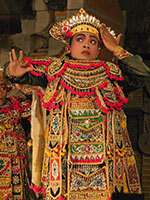 Then the Royal Balinese families moved into Ubud and those who seeked work with them tried to offer to sell them goods. The royals then only started to buy and do business with the very best carvers from Mas and the best painters of Ubud and soon all of the islands best craftsmen moved to their prospective villages creating subcultures orientated around there talents. The carvings themselves differ between representations of the Balinese people often as farmers and in situations that the average Balinese worker can relate to, to amazing decorative carvings for the rich and then also some legends, myths representations of aspects of the Balinese religions and the stories that they entail. Bali Tegalalang Rice Terrace located on the north side of Ubud around 20 minutes drive. This area is famous tourist attraction for beautiful rice terraces, many tourists who travel to and from Kintamani stopped at this place to witness the beauty of the verdant terraced rice field scenery or having lunch at the restaurant while enjoying the beautiful scenery of terraced rice fields. Tegalalang Rice Terrace is one of the tourist icon in Ubud Bali.